Today, Silverwood Partners has published a Strategic Analysis and Deal Review of the natural products and consumer packaged goods (CPG) industry. 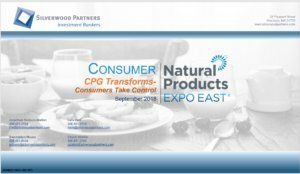 "CPG Transforms - Consumers Take Control" (download) follows their previous publication "The Plant-Based Revolution" (download) as, what started as revolution in plant-based meat, has swept through the industry & transformed CPG forever. Modern consumers - instagram savvy, e-commerce mavens - are demanding control, requiring high levels of personalization from products which must fundamentally conform to their values. We welcome the opportunity to discuss your strategic and financing needs at Expo East. Contact Jonathan Hodson-Walker or Lars Hem to schedule a meeting.